The Game of Thrones Playing Cards Second Edition is a must have. 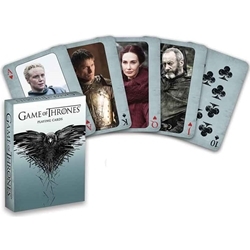 Fans of the HBO adaptation of George R. R. Martins popular Song of Ice and Fire series, Game of Thrones, can now enjoy their favorite characters in a whole new way with the Game of Thrones Playing Cards 2nd Edition. This standard-size card deck includes the traditional 52 face cards plus 2 joker cards. Since the first edition Game of Thrones playing cards released, new faces have emerged in the fight for the Iron Throne. These Game of Thrones characters are portrayed on the face cards and jokers in this collectible card deck. This Game of Thrones card deck makes a fun gift for fans and a must-have addition to any collection.